Solunaris GmbH, located in the heart of the Rhine-Main area in the industry Kalle-Albert, Wiesbaden, was founded in early 2010 with the goal to provide our discerning and global customers with quality products and services for Digital Textile Printing as well as for the traditional Dyeing and Printing industry. Art production and quality assurance technologies at Solunaris guarantee consistently high product quality. 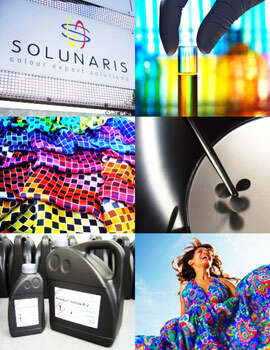 The dedicated team at Solunaris has in-depth knowledge and extensive international experience to offer advice and support to help overcome complex challenges in the textile printing industry. Please visit www.solunaris.com for more information.